Instead of typing full command name in Command line you can use Command Aliases of them . Which are short forms of Full Command names such as Type ‘C’ for Circle, ‘B’ for block. These are not case sensitive so you can type in lowercase or uppercase. 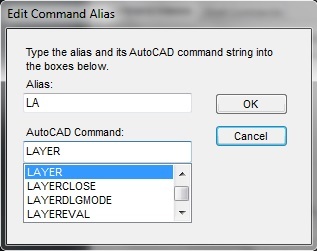 (In AutoCAD 2014)When you type command aliases then you will see as ‘command alias(command name)’ format ex. B(BLOCK). 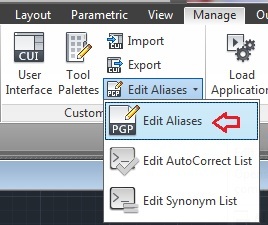 In Drafting & Annotation work space, go to Manage menu > Customization > Click on ‘Edit Aliases’ to open Command Aliases . This will open AutoCAD command aliases list in .pgp file. 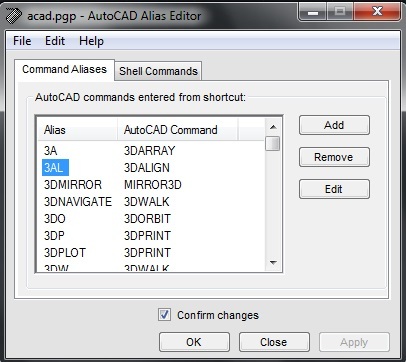 How to edit AutoCAD Command Alias ? 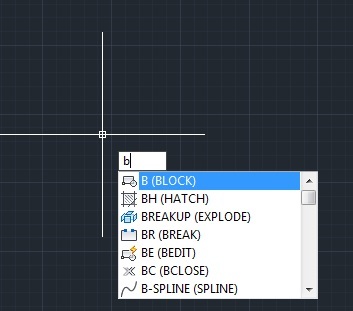 For this you need to use ‘AutoCAD Alias Editor’. You can change existing command alias name or can add new Command alias or remove existing command alias. Note: To turn off this confirmation pop up dialog box uncheck ‘Confirm changes’. To change command Alias and AutoCAD command name double click on command alias , it will pop up ‘Edit Command Alias’ dialog box. If you change existing command alias or assign different command name than default then a Confirmation message pop up as ‘Duplicate found’ to redefine alias for command . example I am trying to change Alias LA for Command LAYER to LAYERCLOSE. Select Yes if you want to save the changes. A message will pop for new change. Click Ok.
Click Apply on ‘AutoCAD alias editor’. A message will pop up for Overwrite acad.pgp Click ‘Yes’.